SPAAT and NBA Hall Famer Gary Payton celebrate the 2018 Oakland ESPY Award Winners! Check out the Oakland Post article covering the event here! View pictures of the event here! A spat (common in sports, popularized by football) is an over-the-cleat ankle tape job that provides support to the ankle, allowing the player to better control his/her body movement and overall athletic performance. Usually, it is part of the player’s ritual of “getting ready to play the game.” Just like the on the field “spat,” The Student Program for Academic & Athletic Transitioning (SPAAT) was created to provide student athletes with the support needed to be ready to play the game of life. No matter what sport they play, we can help them SPAAT up for life! We accomplish this by employing a culturally responsive curriculum that draws on youth’s familiarity with and love of sports to increase academic and positive social engagement. Our approach is founded on evidence based youth development practices that have been proven to be effective. We reach out to socially and economically disadvantaged high school student-athletes in an effort to provide outdoor experiences to give them a better quality of life. Through innovative, strategic goals and a holistic approach to academics and sports, SPAAT is taking the world in imaginative new directions with unlimited opportunities. Our vision is to prepare students for the “The Game of Life”. Through our commitment to creating effective academic skill building workshops, developing and mapping out progressive plans, and educating student-athletes in all areas of development, we strive to enhance the lives of youths and bring positive change to the world around us. Our purpose is simple and straightforward: It’s giving a student-athlete the freedom to take journeys; to discover new experiences; to take charge of the world. It’s the power to connect who they are today with who they want to be tomorrow. In a changing world, we’re changing faster. We are relentless in our pursuit of discovery and innovation, creating and providing academic, community and athletic support services that empower you for college, careers and life beyond sports. Opening the door to a new world of possibility. SPAAT’s mission is to empower socially and economically disadvantaged high school student-athletes by providing them with academic, community and athletic support services to increase the number of student-athletes prepared for college, careers and life after sports. Harold Person is the Executive Director and co-founder of SPAAT. He is a graduate of the University of California Berkeley, with a B.A. in business, and has earned a certificate in College Admissions and Career Planning from UC Berkeley Extension. A student athlete in high school and college, Harold’s experience of being a student athlete in high school and college and adjusting to life after sports inspired him to create SPAAT, which helps serve as a support system for athletes and the challenges they face. Harold has helped Bay Area student athletes and families secure millions of dollars in academic and athletic scholarships. Harold is also a member of Western Association of College Admissions Counselors (WACAC) and American Football Coaches Association (AFCA). Kobié Kennon is a transformation agent for youth with a specific passion for student athletes. She is a graduate of University of California Berkeley, with a B.A. in Ethnic Studies and Education. At UC Berkeley Kobié played basketball for all four years. She is a Bay Area native born and raised in East Palo Alto where she was a student athlete at Sacred Heart Preparatory of Atherton. Kobié holds three Division I basketball state championships. Having nearly 10 years of public and private sector service experience in youth development she brings a dynamic unconventional perspective to empowering youth to excel on and off the playing fields. Prior, she served as Education Coordinator for Youth UpRising of Oakland, CA where she led a wide range of programs which prepared youth for higher education, fulfilling careers and assisted with organizational strategic planning. Kobié has an unparalleled commitment to developing successful student athletes for the game of life. Michael Peters has served as a high school coach, mentor and champion for youth in Oakland for over 20 years. As a McClymonds alum, student athlete and counselor, Michael is an expert at NCAA eligibility and creating support systems for student-athlete success. He has donated thousands of hours of service to the students and community of West Oakland and has personally assisted over 80 student athletes in securing millions of dollars in college scholarships through academics and athletics. 96% OF SPAAT GRADUATES MOVE ON TO PARTICIPATE IN COLLEGE ACADEMICS AND ATHLETICS AT SOME OF THE BEST UNIVERSITIES IN THE NATION. WILL YOU BE NEXT? – and 96% enrolling in a college or university of their choice. We’re enabling student-athletes to succeed by equipping them with the knowledge and skills required to be prepared for college, career, and life after sports. We’re creating competitive college applicants. We provide support in a number of areas in addition to academic performance including SAT/ACT testing, school selection, and application writing. We’re teaching enthusiasm. Our programs steer our students away from criminal activities by increasing their college awareness and decision-making skills. We’re growing communities. We take a holistic approach to mentorship through character building and leadership skills. SPAAT’S APPROACH IS BASED ON YOUTH DEVELOPMENT PRACTICES PROVEN TO BE EFFECTIVE WITH THE SPECIFIC DEMOGRAPHIC THAT SPAAT SERVES. SPAAT EMPLOYS A CULTURALLY RESPONSIVE CURRICULUM THAT CONNECTS WITH THE STUDENT’S FAMILIARITY WITH AND PASSION FOR SPORTS TO INCREASE ACADEMIC ACHIEVEMENT AND POSITIVE SOCIAL ENGAGEMENT. Student athletes often have trouble advancing from basic to complex assignments, tests and projects. Academic skill building workshops cover the core subject areas including Algebra and English. Consistent one on one and group tutoring, along with academic performance training sessions, help to improve grades, test scores and academic confidence. 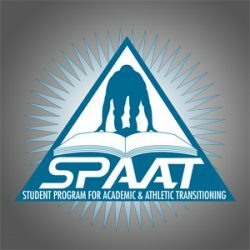 SPAAT works closely with the teachers and coaching staffs to regularly monitor academic and athletic progress of all student athletes. Several methods for assessing academic and athletic progress are used, including progress reports completed by faculty and coaches, and self-reporting done by student athletes in regular academic progress meetings with SPAAT staff. SPAAT staff assists student athletes by helping them visualize and map plans for high school and post-secondary schooling. Our advisors identify the courses student-athletes will need for high school graduation and classes necessary for college entrance requirements. All colleges and universities require that students take the Scholastic Assessment Test I (SAT) or the American College Test (ACT) as part of college admissions requirements. Beginning their junior year, students will take a seven-week SAT or ACT preparation course. At the end of the program, students are able to identify the various types of questions on the SAT/ACT and apply a successful, strategic response. In addition to our in-school Academic & Athletic Support Program, we have also partnered with the Oakland Unified School District’s Oakland Athletic League to offer a series of Student Athlete Camps every year. The goal of each camp is achieved by educating student athletes in the areas of academics, college readiness, nutritional awareness, physical fitness, financial fitness and personal development. Our student athlete curriculum comprised of a series of tests, evaluations, workshops, and professional and motivational speakers serves as the camp playbook. One of the many obstacles that our young adults face today is a lack information about why they should go to college, how to get to college, and what it takes to succeed as a student or student athlete once they get there. This program provides one-on-one college admissions advising and guides our student athletes through everything from college planning to the NCAA eligibility registration. Just as students need to be physically conditioned to play sports, they need to be mentally conditioned for college. The College Conditioning program is facilitated through our “College Playbook – The guide for the college bound student athlete.” The Playbook employs a unique series of college access activities that ensure student athletes have the conditioning needed to be ready for success in college. SPAAT HAS REDEFINED THE NOTION OF A STUDENT-ATHLETE IN OAKLAND BY HELPING STUDENTS MEANINGFULLY ENGAGE IN BOTH THEIR ACADEMICS AND ATHLETICS SIMULTANEOUSLY. STUDENTS SEE THEMSELVES NOT ONLY AS ATHLETES WITH POTENTIAL, BUT ALSO AS STUDENTS WITH POTENTIAL. EMONI WAS 80 CREDITS SHORT OF GRADUATING WHEN HE ENTERED THE PROGRAM. THE SPAAT PROGRAM HAS TAUGHT MY SON LEADERSHIP, RESPONSIBILITY, INDEPENDENCE AND COMMITMENT. THEY SUPPORTED HIM THROUGH HIS LONG AND DIFFICULT JOURNEY IN GRADUATING FROM HIGH SCHOOL. THE SPAAT PROGRAM REALLY HELPED ME WITH THE SAT. I WAS ABLE TO BRING UP MY SCORE BY 450 POINTS. Every dollar you invest in the SPAAT helps to change a student athlete’s life. SPAAT helps students gain confidence around their academic futures that is independent of the athletic futures. Join our team by investing in today’s youth and tomorrow’s leaders. Pledge to Be a Playmaker today and you will help one student-athlete get closer to being ready for college, careers and life after sports. Check out our Tees and Hoodies by visiting our store! Be a Tutor – Assist SPAAT staff in helping youth become better students, learners and competitive college applicants. Be a College Advisor – Assist students in writing personal statements, completing scholarships and college applications. Special Events – Join us at the OAL ESPYS and help with guest registration, refreshments/snack bar and more. Be a Fund Raiser – Help us if you have or want to gain expierence in fund raising or you know individuals or organizations that may be interested in supporting SPAAT. Make an In Kind Donation – Can’t donate or volunteer? Send us equipment and office supplies that would benefit the youth in our programs. Click CONTACT US to Get Involved now!